Another one of the new fighting features is the Assist Trophy. (See document) Can you start me off with a brief explanation? Let’s see, the Assist Trophy is a character that comes to your aid, and people that have played the previous Smash Bros. need only think of the Poké Ball to know what I’m talking about. During a match, a capsule-like object appears on the screen. If someone picks it up, different characters appear and either attack your opponent or perform a non-targeted attack, thus helping the player that picked up the item for a short amount of time. The number of regular characters is impressive on its own, but the number of characters represented by the Assist Trophies is truly something. Take Mr. Resetti from Animal Crossing or the dog from Nintendogs. How did you go about choosing these characters? The most important thing was simply whether or not it would make players happy. 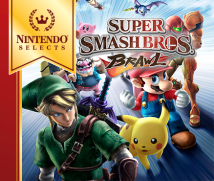 I mean, there are lots of popular games with characters that just aren’t meant for fighting and were too hard to incorporate into the Smash Bros. title. Heading the list of these characters are the ones from the games we just mentioned, Nintendogs and Animal Crossing. Because these are games played by lots of people, I knew players would be happy to see them make an appearance. This is why I wanted to find a way to put them in the game and why they became Assist Trophies. In other words, all it does is block the screen and prevent you from seeing for a few moments. Right. It’s nothing more than a blindfold. (laughs) I mean, puppies don’t exactly do what you want them to do all the time, though, right? When you try to play a game with them, they’ll just hang around you. That’s the aesthetic we were aiming for, but blocking the screen is something you can’t normally get away with in a competitive game like this. I see. You often talk about how Smash Bros. should be played like a sport, but with this game, you’re playing a sport in an area with lots of surprises. Right. You might say I like surprises, or even more appropriately, you might say I love a good prank. That’s why I feel compelled to do the things I do. I see. 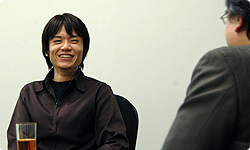 You can’t deny that Smash Bros. is a game that is filled with pranks. Clearly. (laughs) That’s why it’s fun to make and fun to watch people playing. From the player’s perspective, it must be fun to discover the things you’ve incorporated. Fundamentally, I don’t like games that merely add more things. With Smash Bros. though, it’s different and there are benefits to cramming the game with new features. Since it’s like a receptor that will hold anything; I think it’s okay to have a lot of stuff in Smash Bros.